Voila, après une petite discussion avec Genki, on a décidé de créer 2 topics séparés. Celui-ci servira UNIQUEMENT à NEWSER. Tout message qui n'apportera pas de news sera supprimé. Dernière édition par Sadness le Jeu Déc 13, 2007 20:45, édité 1 fois. Comme chaque Mardi depuis 3 semaines, le site officiel a été mis à jour. On retrouve donc les artworks de Furiza, Le garde, bejîta et de Gokû. Quelques mouvements mais tous déjà connus. PS; d'ailleur ne faudrait-il pas transferer le contenu du 1er message de l'autre topic sur celui-ci? La traduction des Scans en anglais. Pretty much tells us the JPN release date for both, which is Oct. 4, 2007. Tells us how the PS2 gets the Disk Fusion system in which this new for the PS2 version unlocks past Ultimate Battle modes from the Sparking! disk as well as the Sparking! NEO disk. The Wii version will have Online capability as you can face other people online as well as to see your ranking on an Online Ranking Mode. This time the small little extra that the JPN version has is a Shenron Key chain. Le mode principal s'intitule "Histoire du dragon". Nouveau concept de combat concept "Batailles Dramatiques(Spectaculaires)." Ainsi, le scénario pourra être changer selon votre progression et les personnages n'adopteront pas les mêmes discours..
A l'affiche;trois nouveaux personnages dévoilés ! Pour l'instant une seule forme de ce personnage est dévoilé et aucune information concernant sa transformation.Il possède une puissante technique appelé "Burst Attack". Il se nomme simplement Goku "GT". Il a la capacité de transformer au stade du supa sayajïn 3 (SSJ3) et on pourra effectuer le "dragon fist"
-Nous aurons toujours droit au combat 5vs5. Dernière édition par MoMo le Ven Juil 20, 2007 09:01, édité 1 fois. Une nouvelle démo du jeu est annoncé par Atari pour le Comic-con ! Atari, Inc. one of the world’s most recognized brands and a third-party video game publisher will feature hands-on demos for two upcoming titles at San Diego Comic Con. 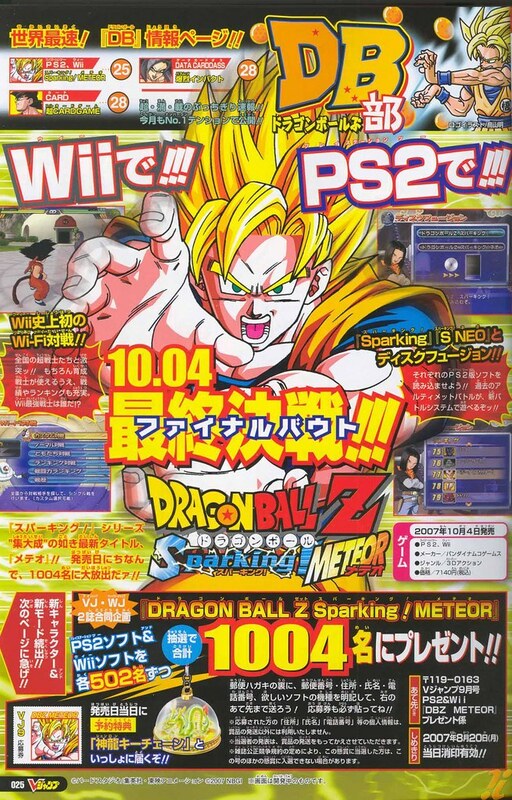 Consumers will be able to get their hands on a brand new playable demo of Dragon Ball Z: Budokai Tenkaichi 3 for the Wii™ home video game system and PlayStation®2 computer entertainment system at the FUNimation Entertainment booth, # 4129. Dragon Ball Z: Budokai Tenkaichi 3 takes the lightning fast fighting, flying and action that made its predecessor, DBZ Budokai Tenkaichi 2, last year’s #1 fighting game and takes it to a whole new level with exciting new features. Dragon Ball Z continues to be one of the hottest brands in the video game industry with more than ten million units sold since May 2002. C'est à dire que la démo sera présenté et disponible au salon du 26 et 29 juillet prochain.Si quelqu'un a l'occasion d'y aller,qu'il nous ramène une tonne de vidéo ! Les artworks précédemment postés en meilleurs résolutions ! Avec ajout de cet artwork ! Pour la partie "features" du site officiel qui a été mise à jour le 7/08,voici la traduction en anglais. Confirmation des musiques originales (jap) mais sans les voix. Note: Some of the questions were slightly edited for spelling/grammar/clarification. UPDATE (08/08/07): All 3 parts are now posted. See below! Q: Is it true that this is the last Dragon Ball Z Playstation 2 game? Why? DC: It's always a tough call deciding which systems to put our games on as they all have positive and negative points. At this point however we feel is time to kick it up a notch and bring you bigger and better games on the latest and greatest systems. We are trading in the old and busted for the new hotness, come along for the ride! Q: Have the transformations been changed or improved? NB: Yes. We’ve been making changes and improvements for not only camera angle but also inserting directions for transformation system. For example, in order for Saiyan to transform to Giant Ape, as you know, they need to see the full moon or power ball. These directions will be implemented into the scenes. DC: They have been improved in a few ways - the lighting and effects on them are more explosive looking and the camera angles are much more dynamic and cool looking! We are also working on making them maybe a little more tricky to do in game just for some added excitement but we aren’t sure yet. Q:Have you made any changes to the leveling system? 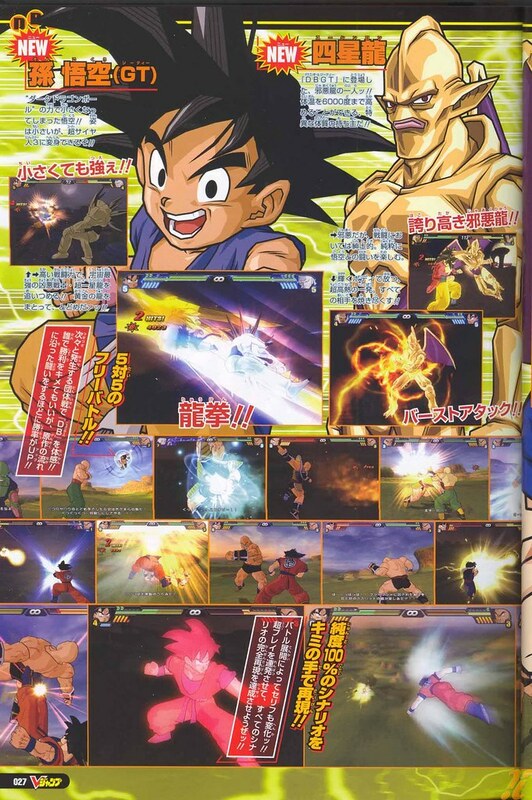 NB: Each character will be leveled up by obtaining Z items. But the use of Z item will be more tactical than previous version. Each item works in good way and bad way. They are relative to each character’s ability. Please think and tell me how to use Z-items in this game! You might be better than Producer Donny Clay! DC: There aren’t many modifications to the actual leveling system per se but as [our Namco Bandai representative] stated there will be new and improved Z items which will help power up your character immensely if you use them correctly. Level up and equip your character correctly and you might have a shot at beating me. BRING IT! 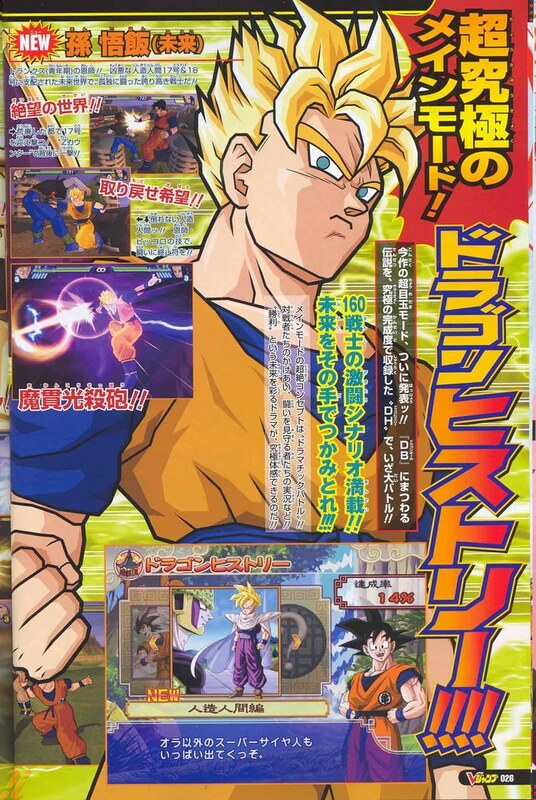 Q: Will we see the return of some old favorites from past games like Chi Chi (Super DBZ), Kid Uub (Budokai 3), and Teen Future Trunks (Sagas: Evolution)? NB: We'll have some but in different forms. DC: Yes you’ll see some old friends and some new ones you haven’t ever played before in a DBZ game. I’m pretty darned excited about the roster we on deck for you guys this time around. Q:What do you think about the evolution of the Dragon Ball games in these past years? DC: I think the games have progressed very nicely over the years we have improved them in every way. Graphically they have been fantastic in my opinion and the fighting systems have gotten better and better. But I know you guys - you want more - and we will serve it up soon! Q: Have the Wii Controls improved greatly? If so, please give examples. NB: Yes. The previous Tenkaichi 2 game was released at launch of Wii console. The innovative Wii controller made so many changes to Tenkaichi, some were greeted positive, while others were criticized. In this game, we’ve been trying to improve the controls by listening to customers, and the controls to be more intuitive and easy for every one to play. DC:They certainly have. We’ve gotten rid of the pointer system so now all the attacking is easily done with just the Wii-mote. All of your movement is handled through the nunchuck. I actually play better on the Wii now than the PS2. Never thought I’d say that, but there it is. Q: Have the character models been improved? NB: We’ve refined all the character models for this game! DC: The models get better every time we make a new game and Tenkaichi 3 is no exception. More polys, better textures, all the usual tech speak you are used to hearing. Don’t take it from me- go check out the latest screenshots, the proof is in the puddin’! Q: Will the new characters have unique attacks or generic ones? DC:They will have a few unique super moves and some unique combos as well. There will definitely be unique reasons to choose one character over another depending on your play-style. Q: Will the stages be bigger in this game? NB: Actually the size of the battle stages has been the same. But it has been refined as much as possible. DC: We felt the size of the battle arenas was very good so we left that alone. They are big enough to create distance from your opponent but not so big you can’t ever find who it is you are supposed to be fighting. The levels all look better and are more interactive than before though that's for sure. Q: When you say “over 20 new characters”, does that include transformations? NB: No, the character itself. DC: We mean 20 new characters - if they transform great, but we don’t count those as separate characters. You will see 20 new faces on the characters select screen…once you’ve unlocked everything of course! Q: Will there be a mini game mode? NB: Yes. There will be some mini-games. Q: Will there be Japanese music in the game? NB: Yes. But not songs. Would you guys like Japanese song inside? DC: Yes we have the Japanese songs in the game but they are instrumentals only, no voice. Q: What is this Dramatic Z Engine? Is it about cut scenes? Will we have more? Or is it something about battles? DC: This has to do with the cut scenes. Instead of just playing every story through just like the show, we are allowing the players to change the outcome for a new story and new scenes. Of course if you like to see these battles just as they are on the show you can do that as well! Q: Is there a possibility that the number of characters would increase above 150 in the time that's left for the game to be finished? Or is it decided already? NB: Yes. There always is a possibility to produce something good for fans! DC: We think we have a pretty full character roster but if there is space to pack more in, we will! Q: What is your point of view on the Dragon Ball series? Should a game developer appreciate the series on which he works for his game? NB: Dragon Ball Z is the gold master of all anime in the world. We’ve grew up watching Dragon Ball Z when we were young. Now we can be a part of the DBZ game development team, and we really appreciate being a part of the team. The last year I traveled to Italy, and in the very small town in Italy there was a TV game shop. And at the very front of the casher desk, Tenkaichi softs were placed. Kids in Italy love to play Dragon Ball Z games. We really appreciate the opportunity to produce TV game with such famous anime series, and on the other hand we always need to put ourselves in hard work because so many fans are waiting for our game all over the world. DC: Dragon Ball set the bar in action anime, I love it and feel very proud working with something so special. Every other action anime I see, I am comparing it to DBZ. I feel that even after all these years there is nothing more amazing than some of the fights in DBZ. As for whether or not a dev team needs to appreciate the series? - Of Course! Everyone who works on these titles are definitely diehard DBZ fans.